Find all points of interests (i.e. coffee shops) around (i.e. a 10 mile radius) the given location (latitude and longitude). For example we want to show this to a user of the mobile application when we know his/her approximate location. (This usually means we need to calculate a distance between 2 points on Earth). Find a ZIP code (U.S. Postal address) for the given location or determine if this location is within the given area. Another example is to find a school district for the given property. Distance between 2 points. The “distance” function was not implemented before MySQL 5.6. In addition (even in MySQL 5.6), all calculations (e.g. distance between 2 points) are done using a planar coordinate system (Euclidean geometry). For the distance between 2 points on Earth this can produce incorrect results. Determine if the point is inside a polygon. Before MySQL 5.6 the functions that test the spatial relationships between 2 geometries (i.e. find if the given point is within a polygon) only used a Minimum Bounding Rectangle (MBR). This is a major limitation for example #2 above (I will explain it below). In my old presentation for the 2006 MySQL User Conference I showed how to calculate distances on Earth in MySQL without using the MySQL spatial functions. In short, one can store the latitude and longitude coordinates directly in MySQL fields (decimal) and use a haversine formula to calculate distance. 1) MySQL 5.6 adds a set of new functions (some of them are not 100% documented though) that use the object shapes rather than the MBR to calculate spatial relationships. Those new functions begins with “ST_”, i.e. 1) All functions still only use the planar system coordinates. Different SRIDs are not supported. 2) Spatial indexes (RTREE) are only supported for MyISAM tables. One can use the functions for InnoDB tables, but it will not use spatial keys. 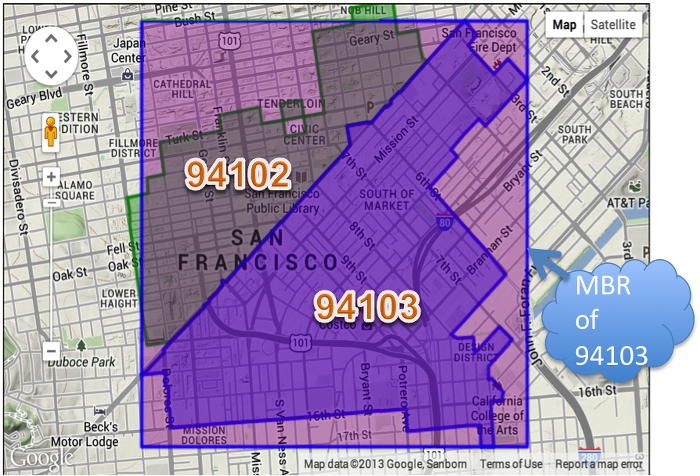 To illustrate why we do not want to use MBR-based functions for geospatial search, I’ve generated 2 polygons that represent 2 zip code boundaries in San Francisco, CA and placed it on Google Maps. As we can see st_contains() produces the correct results. 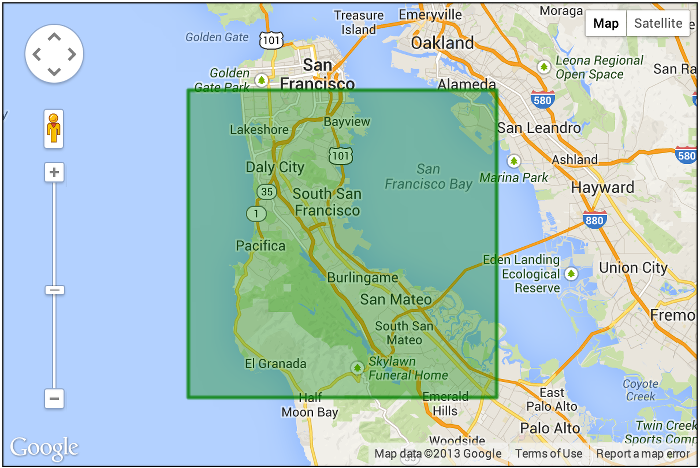 Load the zip code boundaries into MySQL as a multipoligon. There are a number of ways to get this done, one way is to download the shape files from the Census website and convert them to MySQL using org2org utility. (I will describe this in more detail in upcoming blog posts). The data will be stored as MySQL Geometry object, to convert it to text we can use astext(geom) function. The InnoDB engine does not support spatial indexes, so those queries will be slow. As zip boundaries does not change often we can potentially use MyISAM tables for them. Given those major limitations, it is not very easy to use st_distance function for the geo enabled applications. If we simply need to find a distance between 2 points it is easier to store lat, lon directly and use harvesine expression (as described above). @lat and @lon in this example are the coordinates for the San Francisco International Airport (SFO). This is not exactly a 10-mile radius, however it may be close enough. Now we can find all points around SFO airport and sort by distance. As we can see from the explain it will use the spatial key on SHAPE and will only scan 430 rows, rather than millions of POIs. MySQL 5.6 implements an additional set of functions that can help create geo-enabled applications with MySQL. Storing polygons boundaries (ZIP code boundaries for example) is efficient and the new spatial functions (st_within, st_contains, etc) will produce correct results and will use spatial (rtree) indexes (for MyISAM tables only). The OpenGIS standard is very common and it is easy to obtain the data in this format or use the standard application which can “talk” this language. Unfortunately, st_distance function is not very usable for calculating distance between 2 points on Earth and it does not use an index. In this case it is still more feasible to calculate distances manually using the harvesine formula. Hopefully this will be fixed in the next mysql release. There are also some other limitations, for example st_union() function only supports 2 arguments and does not support an array, so it can’t be used in a queries like “select st_union(geom) from zipcodes group by state”. And finally, let me know in the comments how you use MySQL for geo enabled applications. In my next post I will talk more about basics of the MySQL geo spatial extension as well as Sphinx Search‘s implementation of the Geospatial functions. Thank you for this post. I am having this problem above as I would like to use your query concept above but on a database of 800,000 records. Do you think it will perform well? I posted my query here. Any help would be stellar!!! 2. MyISAM table with the index on field you will use MBRContains() or st_within() functions. 3. Where condition which will filter out only needed rows. Will scan ALL rows (800K rows in your case). Will use an index on the shape field and only scan a number of rows. Please let me know if this help. Thank you for the help. Much appreciated. Please contact me as we are interested in working with you to help optimize some of our geo location tables for our directory software platform. I will be happy to work with you using Percona Consulting offering (https://www.percona.com/products/mysql-consulting/overview). You can also contact me by email or my linkedin (http://www.linkedin.com/in/alexanderrubin). Meanwhile please feel free to post any questions here. Nitpick, it’s haversine, not harvesine. I’ve followed your brilliant guide to create a db which contains poi. Unfortunately once I’m explaining the within distance query I see that if there are more then 4 items explain shows ALL as a type of a query. Could you please spell it out for my why is that and how should I overcome it? As I said once I remove 2 of random items MySQL starts using spatial index. Thanks up front for your answer!! Aleksander, sorry I’ve missed you comment. I believe this just too small amount of rows and MySQL will prefer to use full table scan instead of index. Have you tried with the larger data amount? The following query takes 22 sec in table. I wanna mention than in my business table I have 10+ million data. Also, by doing a count(name) I found it got 1992312 data (~2 million) . Is it expected or Im doing anything wrong? Im using mysql 5.6.16 and I do have a spatial index on spatial_location field. That’s indeed a solution with more rows the query starts to be executed with an index. Thanks! Yes, you are right, in this example if you have a lots of rows in the business table it can have to scan too many rows. For 200 miles it may scan a lot. 2. Use other filters in the where clause and filter by restaurants only for example. One potential way of fixing this problem will do the “incremental” approach, first try with 10 miles then with 25 miles, etc and stop when you will get 10 results back. Ya thats is what I was thinking too. But the main problem is to create an algorithm to get the desired number of data with as less increment step as possible. Lets think we need to fetch 1000 data. and with @dist =10, we get 150 data. So, on the next step, we should increment by 1000/150 = 6.66 ~ 7 times. Means, next query will run with @dist = (10 * 7) =70. I know this may not be a perfect solution but what do you think? Can you suggest me any better idea? Looks ok. Another option will be to filter by type of business for example: “where st_within(…) and type=’restaurant'” (but it will not be a combined index) or “partition” the table by the type of business. I need to get distance of a ponit (x, y) from a polygon. Do we have any function in mysql to calculate the same?? It seems like the Polygon-in-Polygon-test does not work most of the time. I would like to combine a spatial index with a Btree index on a varchar. For example I would like to know where all airports are within a certain region, and to speed up the query I don’t want to consider rows in my table that represent coffeeshops. So in addition to the spatial index I also want to provide a type of the place, is that possible? And could you give me some hints on where I could find the information to do so? Unfortunately, it does not work – MySQL will try to choose the best index, based on index statistics, either spatial or btree. What you can do thou is completely avoid using spatial index, calculate the MBR manually. Here are 2 way to do it. Where X1, Y1, X2, Y2 are constant that you have calculated manually to “draw” a rectangle, similar to contains does. st_distance can calculate the distance between point and polygon. You can also use centroid() function to get the center of the polygon. Thanks for your help and quick reply. I tried option b) the approach using a multicolumn BTREE index, however it appeared to be twice as slow as my original approach using the spatial index. Therefore I will stick with the spatial index for now and split up my table for different types of places, which I think is the best solution in terms of performance. values ex: -7.98478 112.63213,-7.90000 112.60000 (two point). First of all I must admit that I am a ‘Silver Surfer’ and am not a coder as such, so if the answer to my question is positive I will need to find some kind so soul to help me with the coding! My question is based on the known positions of aircraft. select * from aircraft_positions where st_distance(pos, point(@lat, @lon)) < 10 Where @lat, @lon is the lat and log of the known point (an airfield) and pos should be stored as geography in MySQL. Hope that helps. i am using following query to get distance from given lat lng and sorted. Thanks for this post – it was exactly what I needed on a project I am working on. Good stuff and greatly appreciated. I need to select records which present around 30 miles circle from current location, I used geohash and also long and lat. I have millions of record in cluster. Which will be the best option to query data with high performance. I would like to draw a 500m buffer around a GPS point with mySQL. Dear Alex good Night, see if you can help me, can you check what is wrong in my code above, because is not working. Spatial is supported with TokuDB? Can you please share the “waypoints” table structure?